Several thousand asylum seekers were suddenly released by U.S. immigration and some are now in San Antonio. It’s 3 a.m. Saturday and Bertalina is shivering at the San Antonio Greyhound Bus Station. She and her son were released hours ago from a border patrol holding facility in McAllen and then sent to San Antonio. Bertalina is one of several thousand asylum seekers suddenly released by U.S. immigration. And as a caravan of Central Americans makes its way to the U.S. border, San Antonio will continue to see a sudden surge in the number of immigrants, testing the limits of local non-profits to provide assistance. Bertalina, a Honduran citizen, said as cold as it is at the bus station, it was much colder at the “hielera,” which is Spanish for a cooler, but is also what they called the frigid holding cells she sat in for the last five days separated from her son. Bertalina said he was kept in an area called the "dog kennel" and she could hear him crying for hours. Now, reunited and released, they are making their way to Los Angeles to join a family member. But the child has a heavy deep cough that he contracted from his days in custody and it will serve as a constant reminder of their detention. Immigration and Customs Enforcement issued a statement saying the release began on Oct. 23 due to the limits in its authority. “After decades of inaction by Congress, the government remains severely constrained in its ability to detain and promptly remove families with no legal basis to remain in the U.S. As a result, family units continue to cross the border at high volumes and are likely to continue to do so, as they face no consequence for their actions,” the statement read. Some critics of ICE question the timing. They wonder if the release is somehow connected to the midterm elections where immigration is a central issue. However, LaRock said she avoids putting a political spin on events — still, she’s mystified. 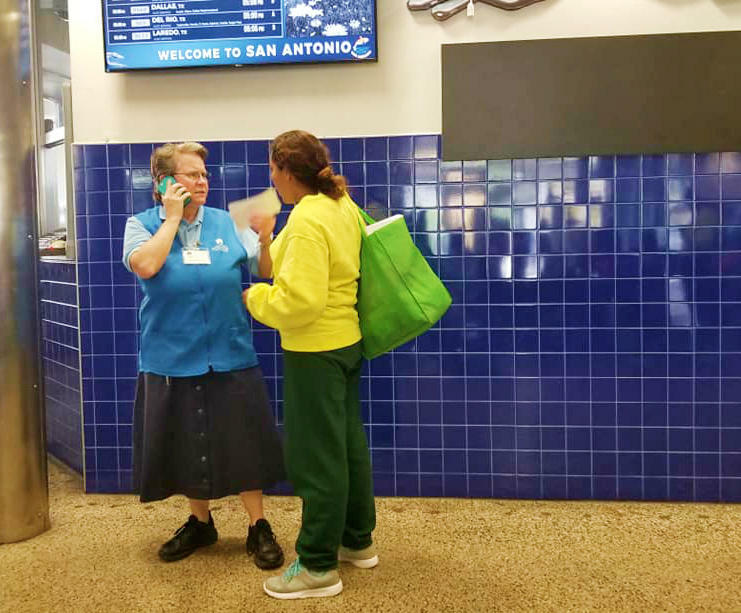 Sister Denise LaRock, left, with the Interfaith Welcome Coalition is helping support asylum seekers as they pass through San Antonio. Then, two buses pull up — one right after the other — from immigration detention centers. More busses are expected. Many of the families have been detained for weeks. They enter the bus station in a state of wide-eyed wonder. Clipboards in hand, LaRock and her fellow volunteers go to work, assessing the needs of each person: Where are they trying to go? What bus do they need to be on? Do they need help with a phone call, a change of clothes, something to eat? Some need help with their uncertain immigration status. “The immigration status is: Everyone that I’ve talked to so far is seeking asylum and they have notices to appear in front of an immigration judge in the near future,” she said. Nate Roter, a post-release manager with the non-profit Refugee and Immigrant Center for Education and Legal Services, sits on a bench near the cafeteria and talks with a line of refugees with a file box of documents at the ready. Roter said these people are not in the country illegally. They are using the established asylum process, which is part of the U.S. legal system. “My general sense is that there’s a sense of relief of being out of detention but also it’s just the first step,” he said. He said there are long waits to have an asylum case heard and along the way there are check-ins with ICE and a complicated legal process. But for now, the challenge is to get the refugees on their feet and on the right bus as they seek their place in America. CORRECTION: The name of the Refugee and Immigrant Center for Education and Legal Services was incorrect and has been updated in the story. TPR regrets the error. Immigration and Customs Enforcement last weekend began a targeted deportation of Central Americans who are in the country illegally. That includes families in Texas. Thousands of Central American women and children fleeing violence have been released from family detention centers in the last 18 months. But there aren't enough community and legal services to help them make their cases for asylum. That’s according to Johnathan Ryan, executive director of the Refugee and Immigrant Center for Education and Legal Services, RAICES.